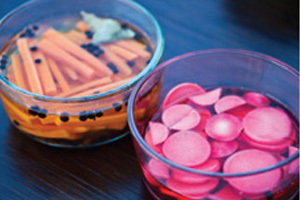 Pickles don’t have to take days or weeks to make at home. 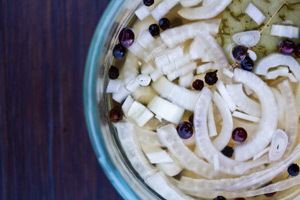 With the right pickling liquid recipe and thinly sliced vegetables you can make what chefs refer to as a “quick pickle.” Quick pickles develop a lot of flavor in just hours, and get even better as time goes by. 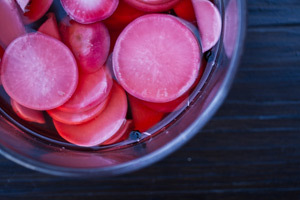 Below you’ll find our favorite pickling liquid recipe, the basic quick pickle technique, and tips for pickling specific veggies. 1. Combine all ingredients in a saucepan on the stove. 2. 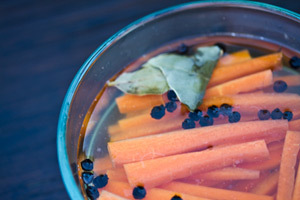 Bring to a simmer, then pour over raw vegetables (this will partially cook them, but leave them with some crunch). 3. Let cool and use immediately or refrigerate for use within one week. Peel and cut into thin sticks (batonnets). Cut into wedges or slice into 1mm thick rounds. Peel, halve, and slice ~1mm thick.